Chroma Zenit makes a difference in several specialties – from recovery, intensive care, rehabilitation, etc. Read more about selected specialties below, or contact us if you want knowledge about a particular specialty. We often offer a tour at the hospitals where we have implemented lighting, so you can hear the user’s experience in the same specialty as you – and you can experience the effect of light with your own eyes. Patients in neurosurgical intensive care are vulnerable and require special care. When the patients become conscious, they typically do not know where they are. They are confused, unable to orient themselves – and their circadian rhythm is often disturbed. Chroma Zenit Circadian Lighting have an immediate noticeable effect on both patients and staff – and affect the patient’s sleep pattern in a positive way. A patient who gets a full night’s sleep is better rested – and thus less confused and thus ready for early rehabilitation. 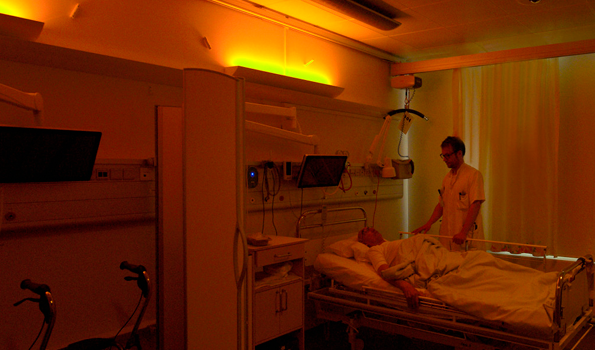 The neurointensive care section, NIA, at Aarhus University Hospital were the first to use Chroma Zenit Circadian Lighting and have documented the effect on both patients and staff through several clinical studies. Chroma Zenit Circadian Lighting by Chromaviso have an immediate noticeable effect on both patients and staff - and affect the patient's sleep pattern in a positive way. In the neuro rehabilitation departments, patients come directly from neurointensive care and remain very vulnerable. Patients may be uneasy with trauma and have a risk of delirium. In addition, patients often have a disturbed circadian rhythm. With Chroma Zenit Circadian Lighting, the patients’ circadian rhythm is normalized, the number of depressions is halved and the fatigue, which is typically a very big problem, is significantly reduced. This means that the patients will begin their rehabilitation and further treatment faster. The unit of clinical apoplexy at Rigshospitalet Glostrup has had Chroma Zenit since 2013 and has, in a Phd. study, documented the effect of the light on patients – a study that has been internationally recognized. In addition, the Hammel Neurocenter also has Chroma Zenit Circadian Lighting. In general intensive care, the patients remain in their most acute and critical phase of their disease – and they therefore need intensive care and treatment. Continuous sleep and a stable circadian rhythm affect positively on the rehabilitation and well-being of intensive care patients. Chroma Zenit Circadian Lighting helps to provide a natural circadian rhythm for both patients and staff. Chroma Zenit Circadian Lighting is activity-based and zone-divided, enabling staff to perform their work without disturbing the patient. At the same time, the circadian lighting is equipped with a special night light that does not interfere with the production of sleep hormone melantonin. In the cardiological intensive care unit there is highly exposed patients with a need of highly specialized care and treatment. Some of the patients are characterized by intense delirium in the form of unclear awareness, disorientation, impaired short-term memory and altered sleep rhythm. For these patients, a stable circadian rhythm is important. Chroma Zenit Circadian Lighting is programmed to follow the sun’s rhythm throughout the day and features a special night light that does not interfere with the production of sleep hormone melantonin. At the same time, the circadian lighting also spares the employees in the night shift from the unhealthy effects of traditional artificial lighting while Chroma Zenit Circadian Lighting provides the ideal light for working with care and treatment of patients and other tasks.